Stack Rugged DVR features multi-camera high quality video, GPS and Data Overlay with CAN / Ethernet link: agricultural, aviation, aeronautics, defence, first-responders, police, transportation, broadcast and high reliability industrial applications. For high quality video recordings on the move, Stack’s miniature Solid-State Digital Video Recorders (DVRs) provide the optimum solution and are engineered specifically for harsh mobile environments. DVR3 digital video recorders from Stack employ broadcast standard MPEG-2 video compression to record high quality real-time video/audio direct to a Compact Flash (CF) card. The card can be removed with ease and played on a PC or laptop using a standard media player application. Recordings can be archived direct to DVD for playback on either a PC or a DVD player. 128GB Compact Flash card capacity mean that 72 hours of full resolution video recording is possible – perfect for surveillance applications. 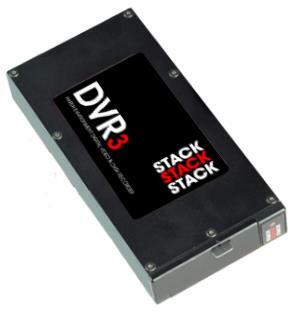 Click to enlargeStack DVRs have a built-in CAN interface, enabling connection to any Stack Display or Logging System, or third party ECU, to provide synchronous data and video recording and/or overlay of performance data on the video. Data from the Stack system plus the internal 3-axis g-sensor and optional GPS receiver, are recorded with the video onto the CF card for subsequent replay and analysis using the Stack DataPro software supplied. The track-map can be calculated from the GPS data, or from inertial data (speed, lateral-g force). Any point on the trackmap can be selected with one mouse-click, allowing the user to navigate through the video and data with pinpoint precision. The user can compare two laps of data from different drivers, runs, cars, etc. With the addition of side-by-side video recordings, and single frame-stepping through the data, now you can literally see WHERE and WHY time between 2 drivers /runs is gained or lost! Click to enlargeGeoMaps is a new optional feature for DataPro. The Geospatial Map visualization provides satellite imagery for GPS data overlay. Load a run with latitude and longitude channels and a satellite image will be displayed behind the GPS route, no configuration necessary! The CAN interface allows a DVR3 to be directly connected to one or more Stack data expansion modules or a third party ECU. A serial port is available to connect an optional GPS Receiver which outputs NMEA 0183 serial data packets to provide speed, position, altitude, time and date information. We have also introduced an Ethernet interface which provides a stable communications network interface that can be accessed virtually anywhere. As well as fast downloading of video, audio and data recorded, the ethernet link can be used to to connect additional input devices for recording. With its own IP address, the DVR3 also becomes fully programmable from any PC on the network. Stack’s 3rd party CAN interface option (ST8339) consists of the CAN Gateway Template Editor tool for the PC, a wiring adapter to allow the DVR to be connected to the CAN Hi and CAN Lo outputs of the CAN device, as well as an authorisation PIN code. This allows the DVR to be connected to a wide range of devices including Engine Control Unit (ECU) modules, navigation modules and specialist sensors outputting in CAN format. Data from the CAN device can then be captured by the DVR and used for video data overlay and / or metadata recording. With the metadata recording option, video and data can then be accessed in Stack’s DataPro analysis software. It provides a single box solution for customers wishing to record video, audio, internal accelerometer, GPS and CAN data to a single Compact Flash (CF) memory card. The GPS and G-force Data Overlay option enables data from these CAN and/or GPS sources, together with the internal 3-axis g-sensor and internal real time clock, to be overlaid on the recorded video image. Positioning the data on the image is simple, using the drag-and-drop PC configuration software supplied (above). A screen-shot from one of the camera inputs can be used as a background to further aid overlay composition. As well as the conventional record mode, the DVR3 range also provides a continuous loop record mode, whereby once the CF card becomes full, the DVR continues recording, overwriting the oldest recordings. The DVR3 range also include an Event Recording mode, to enable specific externally triggered events to be recorded, with user selectable pre-trigger and post-trigger periods. Alarms are a method of controlling features of DVR3 based on the values of data channels reaching or passing through preset limits. For example, it is possible to start a video recording when the Lateral G channel exceeds 1G. Stack DVRs feature a rugged machined aluminium housing specifically designed and manufactured to protect the unit in harsh and extreme environments. The unit is compact and durable with no moving parts (other than the sealed CF card access door), and is capable of operating where normal VCRs or DV recorders are not. Recording in harsh environments, such as continual shock and vibration, and extreme climate conditions is now entirely possible, making it ideal for most demanding recording applications. Its anti-vibration (up to 20g 50-2000Hz swept Sin. 12hr x 3 axis) and shock-resistant abilities (50g, 15ms) are perfect for consideration as commercial off the shelf (COTS) equipment. Stack DVR’s have been successfully used in many demanding applications such as land-based military vehicles, aerospace, marine, subsea inspections, UAV (unmanned aerial vehicle), high reliability industrial applications and many more. Because of the sensitive nature of many of these applications, we are unable to publish details here. We may be able to furnish broad case studies on an individual basis – subject to checks, please sales@stackltd.com. The new Stack range of DVRs has a model to suit your needs: choose from variants offering up to 4 camera inputs, higher bit-rate options for broadcast quality recordings, models offering completely sealed units to IP67, extended operating temperature ranges, and extended recordings capacity. Stack DVRs provide superior high-quality video recording in real time over a wide range of bit rates suitable for different applications – up to 20 Mbps is available, quality equivalent or better than DV tape. Stack DVRs have been used by broadcast companies to achieve recordings under the most demanding conditions. Up to 50 Mbps video recording capability is available by special request. The DVR3-540 offers 10 selectable fixed bit-rates (1 to 20 Mbps) and Variable Bit-Rate (VBR) that can achieve bit-rates in excess of 30Mbps, even up to 50Mbps – dependant on image content. This matches the maximum bit-rate of Blu-Ray (in comparison, DVD’s maximum bit-rate is 9.8Mbps). The higher bit-rate not only gives sharper pictures and more vivid colours but is better capable of capturing fast-moving content such as sport without introducing compression artifacts. An option on the DVR3-540 is Intra-frame (I-frame) only record mode – a great benefit to video professionals using a non-linear editing system such as Avid or Final Cut Pro. Stack’s DVR configuration utility software gives the user full control of recording options including recording quality, screen aspect ratio, sound levels, g-sensor recording triggers and CF card formatting.